With the Academy Awards coming this Sunday, I thought it important to weigh in on why MAD MAX: FURY ROAD is the best picture of 2015. Yes, it has wall-to-wall action and testosterone out the wazoo, but is that enough to make it the BEST film of the year? Does it justify its ranking above this year’s other heavyweight awards contenders like SPOTLIGHT, CAROL, BRIDGE OF SPIES, et al? New Trailer for THE BFG! Disney (sigh) just released the new trailer for THE BFG, a film based on the popular children’s novel by Roald Dahl about a girl name Sophie and her adventures with a Big Friendly Giant. The film has a powerhouse crew, with Steven Spielberg directing and bringing along his usual team of stone-cold pros: Janusz Kaminiski (cinematography), Michael Kahn (editing), and John Williams (original score). Weta Digital (THE LORD OF THE RINGS) is doing the visual effects. Additionally, the screenplay is written by Melissa Mathison (E.T. THE EXTRA TERRESTRIAL), so we can’t help but expect great things from this movie. Mark Rylance plays the BFG; we saw him recently in Spielberg’s BRIDGE OF SPIES and he gave a fantastic performance. We look forward to seeing him next year in the role of a giant! THE BFG comes to theatres on July 1, 2016. It also stars Penelope Wilton, Bill Hader, Rebecca Hall, Jemaine Clement, and Ruby Barnhill. Yep, the new trailer for STAR WARS: THE FORCE AWAKENS is out. This trailer gives us a closer look at the characters that will be featured in Episode VII, including Rey (Daisy Ridley), Finn (John Boyega), and Poe Dameron (Oscar Isaac). Still no sign of Luke though? Action, explosions, drama, and Industrial Light & Magic kicking it into overdrive – looks like everything STAR WARS should be. Let’s hope it’s good! Watch the trailer and unleash your inner geek! What is your reaction to the trailer? Let us know in the comments! STAR WARS: THE FORCE AWAKENS is directed by J.J. Abrams (MISSION: IMPOSSIBLE III, STAR TREK) and will be released on December 18, 2015. The film stars also Harrison Ford, Mark Hamill, Carrie Fisher, Adam Driver, Andy Serkis, Lupita Nyong’o, Domnhall Gleeson, Anthony Daniels, Peter Mayhew, and Max von Sydow. First Cast Photo from STAR WARS: ROGUE ONE! The first cast photo from the upcoming STAR WARS: ROGUE ONE is out and features a very cool ensemble cast, not the least of which is… holy crap, DONNIE YEN! Donnie Yen is a veteran martial artist, actor, and badass, probably best known for playing my ancestor, the legendary IP MAN, in the film of the same name and its sequel. They are both great films and are currently available on Netflix; or you can get them at Amazon here. STAR WARS: ROGUE ONE is currently in production and is directed by Gareth Edwards. It is scheduled to be released on December 16, 2016. 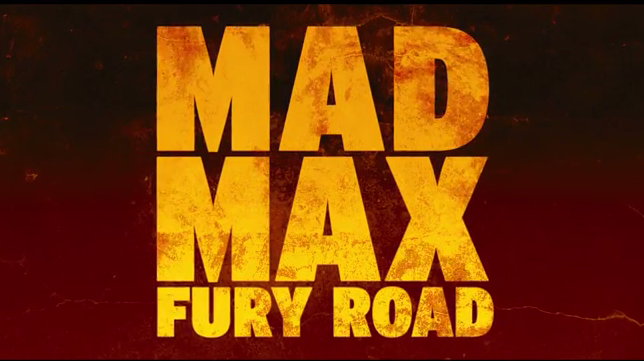 MAD MAX: FURY ROAD is the blueprint for action movies. The characters drive the action and the action drives the characters. They do things for a reason, and they are a product of their circumstances.